The OPM 5000 Oxygen Analyser (%) manufactured by Orthodyne meets the requirements of industrial gas production. It includes the Paramagnetic sensor technology with built-in metallic reference. Oxygen is one of few gases showing significant paramagnetic properties which can be used for its measurement using the following method. A small glass dumbbell filled with nitrogen is placed in an inhomogeneous magnetic field within the measuring cell. The system’s position of rest is defined by a light beam, a mirror on the dumbbell and a photo detector. The dumbbell is diamagnetic and tends to turn away from the magnetic field. The paramagnetic oxygen molecules of the sample gas, however, are drawn into the magnetic field, either displacing the dumbbell or forcing it to turn in the opposite direction. The turning is stopper by an opposite magnetic field generated by means of a coil around the dumbbell, the signal of the photo detector (deviation of the dumbbell from its position at rest) determining the necessary current intensity. The difference between the current when pure nitrogen is flowing and the current when sample gas is flowing across the measuring cell is proportionate to the concentration of oxygen in the sample gas. The paramagnetic measurement is not dependent on inlet pressure as long as pressure is in working range. However, the measurement is dependent on the outlet pressure. Compensation measures are necessary, in particular for measurements above concentrations normally found in the air of a room (back pressure regulator, pressure measurements at the outlet with calculated compensation, etc.). The OPM5000 measuring cell has a small measuring volume of approx. 3cm¬ and it is heated and regulated at a fixed temperature of 55°C. The selectivity of the measuring system is based on the extraordinarily high susceptibility of oxygen. The susceptibilities of other gases are relatively so low that the presence of foreign gases can be ignored in most cases. Significant measuring errors occur where the sensor has been calibrated with nitrogen as reference gas, but the sample gas consists mainly of other gases with considerable magnetic susceptibility. The Oxygen sensor shows a measured value even if the sample gas contains no oxygen, i.e. it displays a cross-sensitivity to another gas. Such gases often occur as process gases but are not available as test gases for calibration, especially not as a mixture. 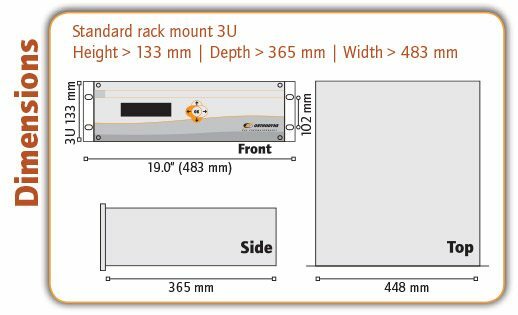 *OPM 5003 and OPM 5004 will be assembled inside a rack of 365mm depth and 6U height.and 6U height. Gas flow (pressure compensated) 240 ml / min. Gas flow (flow compensated) 100 ml / min. > Cryogenic truck loading station.